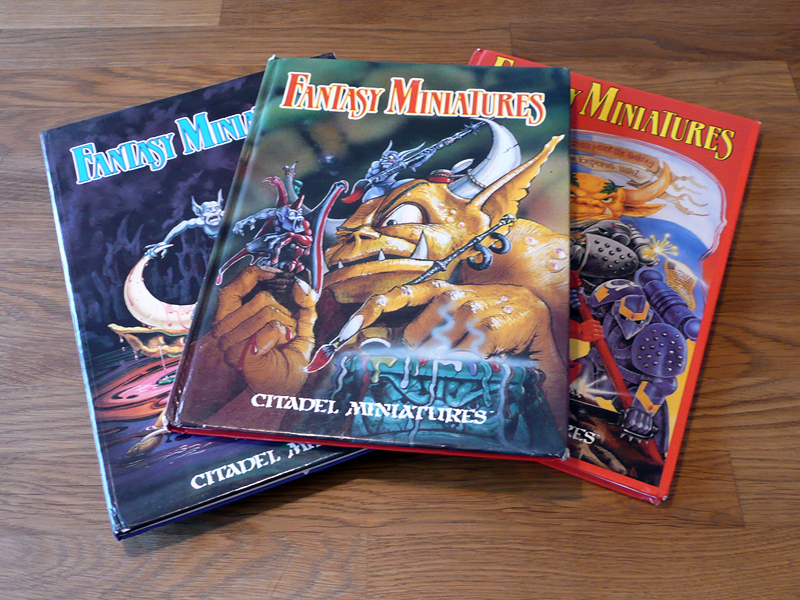 It’s time for a closer look on some more books, namely three books from the same series; “Fantasy Miniatures” from Citadel/GW. The idea behind these are to collect photos of the entries and winners of the Games Day painting competitions. The books were published in the late 80s and early 90s and are unsurprisingly out of print. I don’t think any further books were issued in this particular series, but GW have since published a few more books on the same topic. Let me know if I’m wrong. The contents of the three books are very similar. 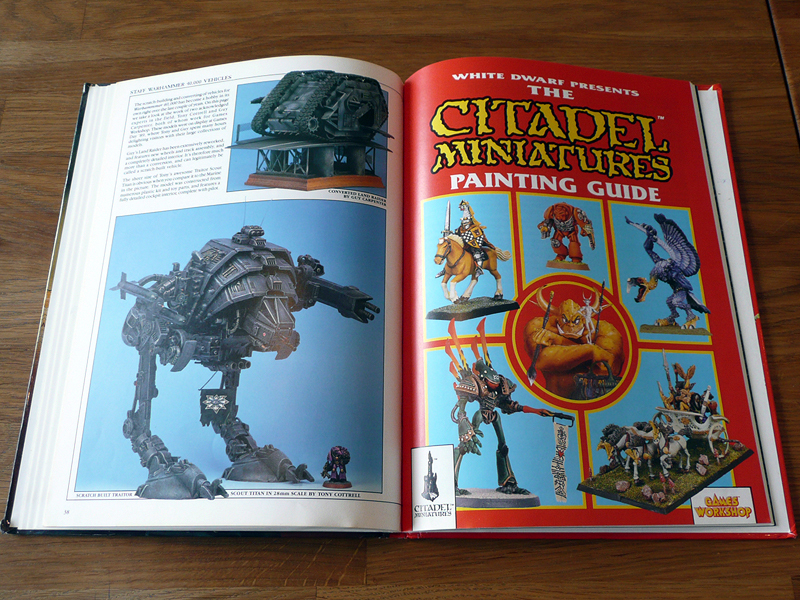 We get about 40 pages of painted Citadel miniatures, grouped into three main sections; studio shots, competition entries and winners. The biggest difference between the books are the page counts, models depicted and some sub categories. 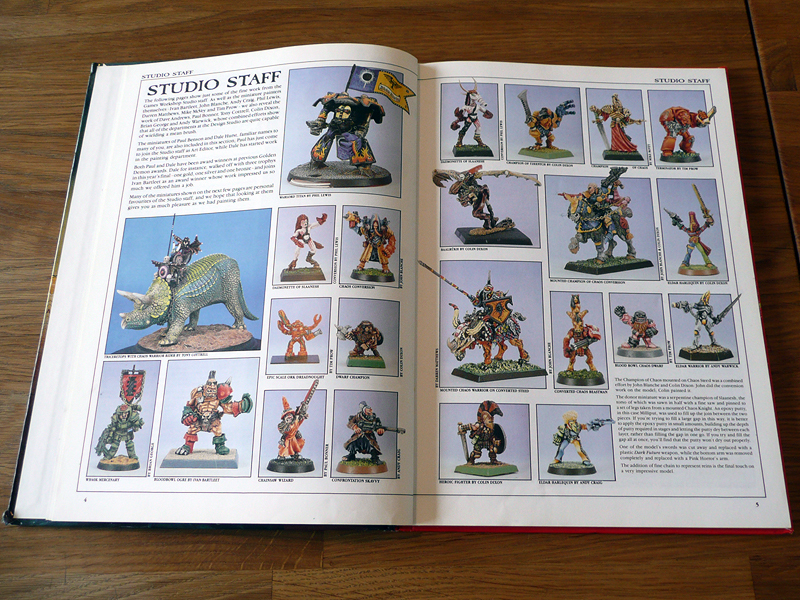 The first 1988 and 1989 books have painting guides at the end, while the 1990 book doesn’t. It instead offers more pages, with fewer but larger photos on each page. Let’s have a look at them individually. As this is the first book published, there’s a bit of background story in the beginning of it. 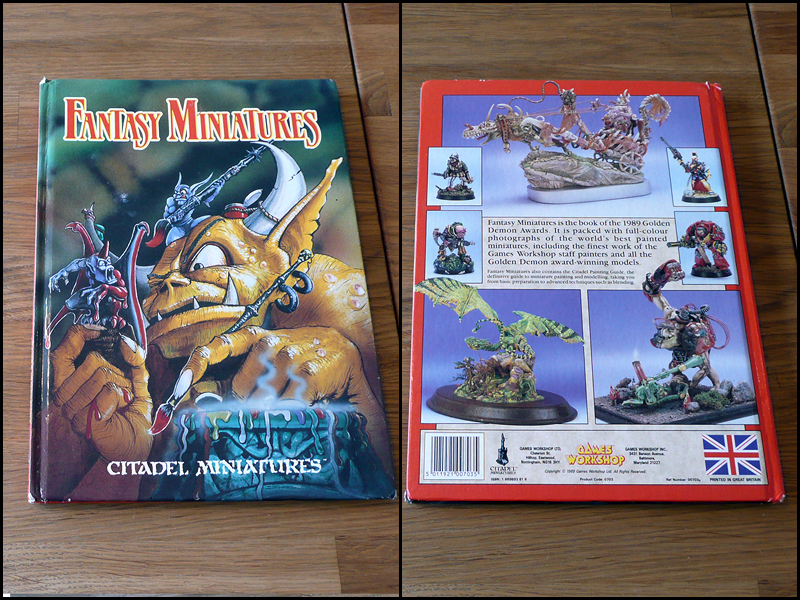 The history of Citadel Miniatures is outlined, as well as the origins of the Games Day and Golden Demon competition. It’s a nice read, albeit a bit frothing about how tremendously swell GW is. I’d say the best part of this book comes allready at page 5, where we’re treated with a hilarious picture of the GW studio staff anno 1988. 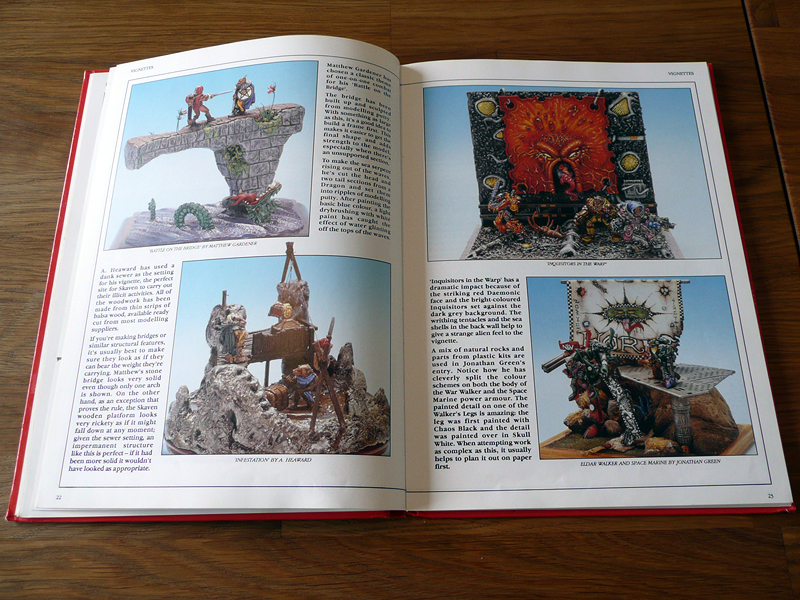 The mix of photos throughout the book is very nice, with an emphasis on single fantasy miniatures (which fits me). In particular, I like the studio pages. 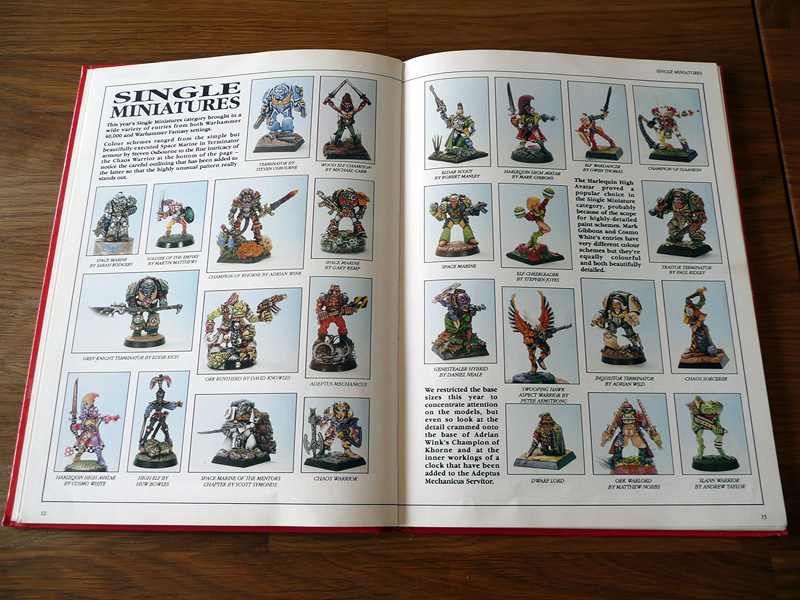 These are ofcourse the same old studio pics of single minis and if you allready have all White Dwarf, journals and catalogues from this era I suppose it’s old hat. I don’t, so I love it! After the studio pages, we’re treated with galleries of a few notable painters; Paul Benson, Fraser Gray and Michael Imming’s fantastic creature dioramas. 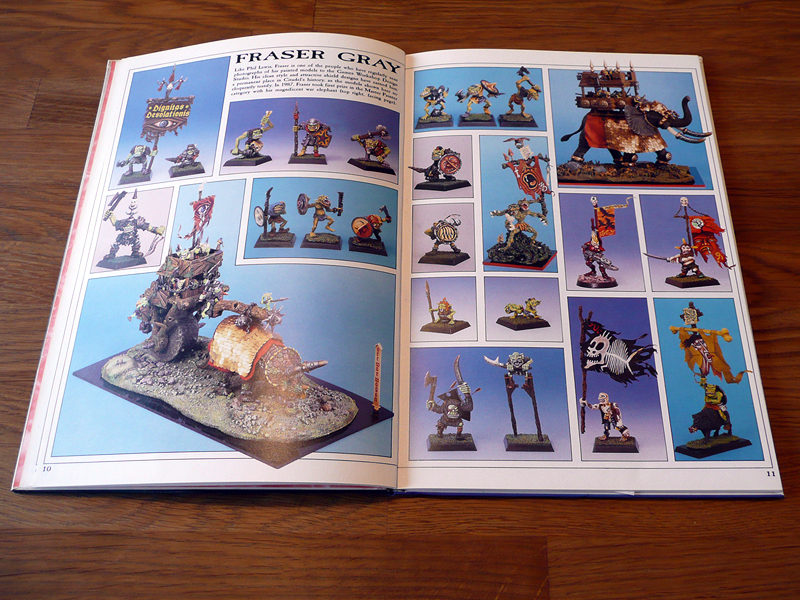 I’m especially fond of Fraser Gray’s orcs though. 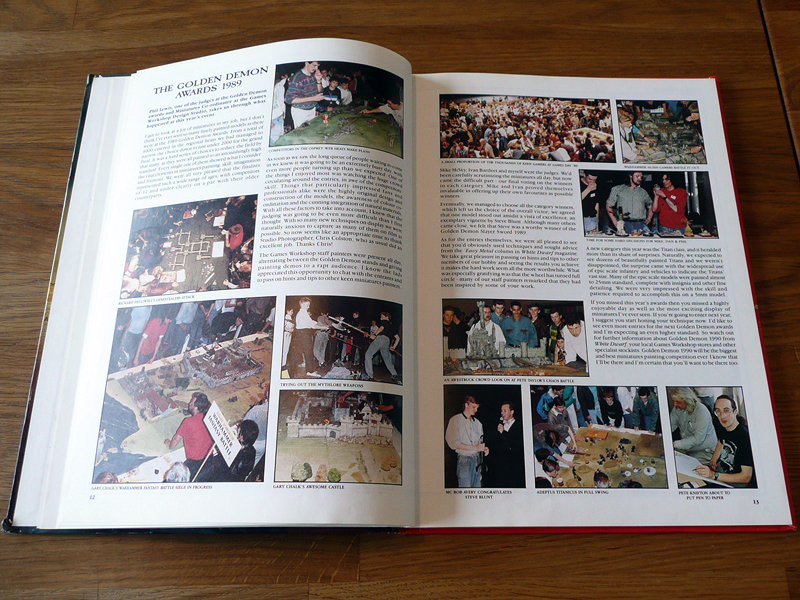 Next is a spread with the winners of 1987, followed by sixteen pages of the 1988 entries organized by category and finally six pages with close ups of the winners. The last two editorial pages cover the basics of painting. A bit pointless, really. 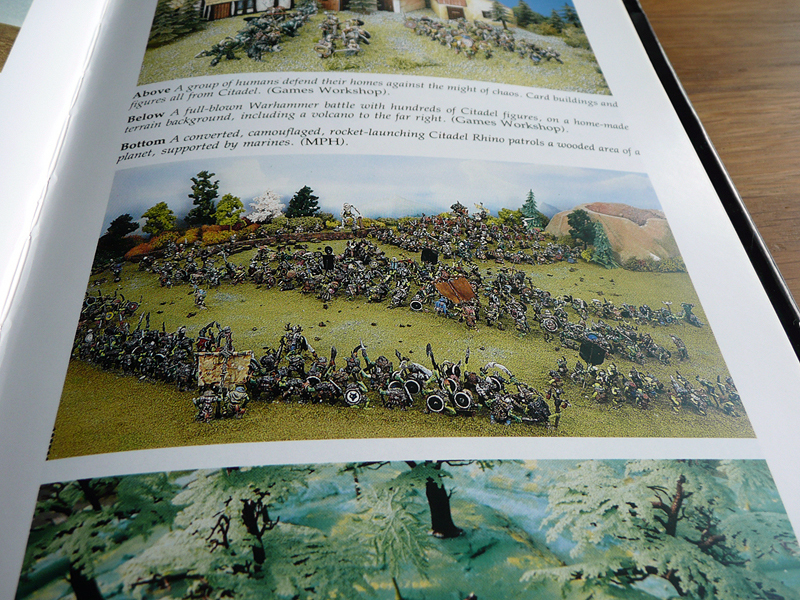 Apart from that, the book is a solid gold-mine of old miniature photos. If I should complain about anything, it might be the quality of the photos (or reproduction there of). They’re a bit fuzzy at times. It’s also the thinnest of the three books, at 40 pages. This is basically more of the same as in the 1988 book. 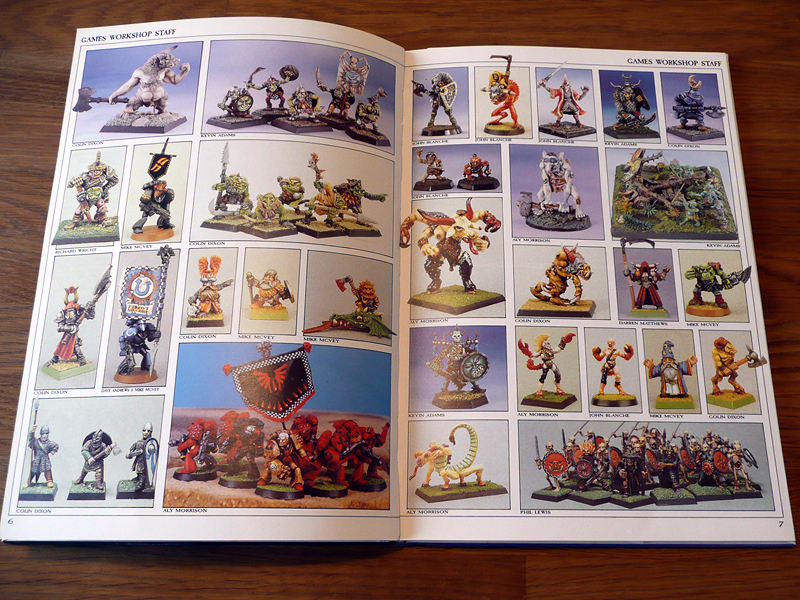 There are more Blood Bowl minis in this, which is a good thing. 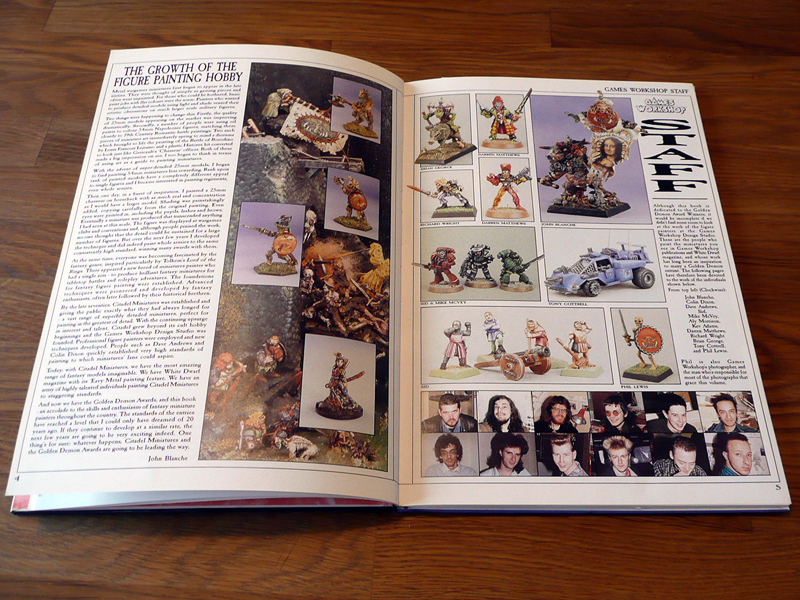 The ’88 book had virtually no Blood Bowl in it. Apart from that it’s almost identical. The printing of the photos is a little better, I believe that’s all. Oh, and there are more entertaining pictures of the crowd at Games Day. Atleast I never had a mullet… oh wait, I actually did! 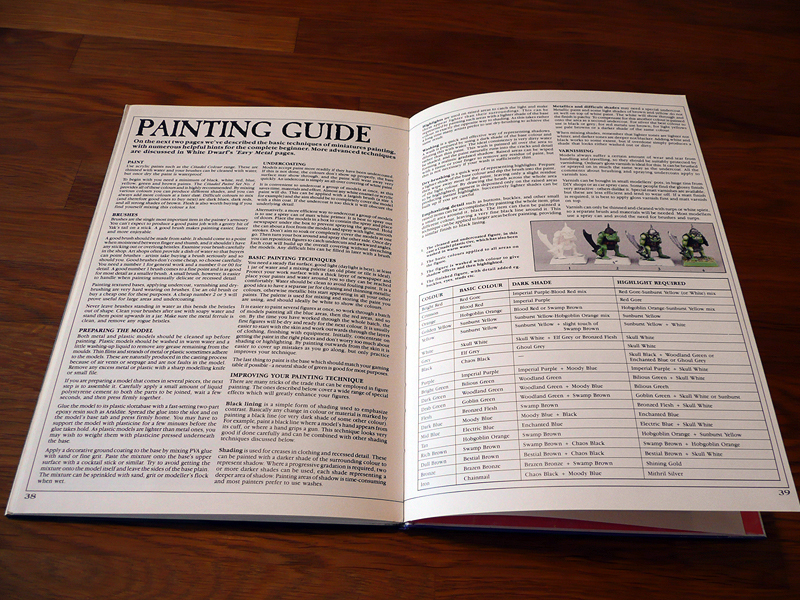 Also, there’s a fairly sizeable painting guide at the end – adding sixteen pages to this book. This guide was available as a separate publication, and is very well produced. All painting steps are illustrated with several examples and it’s actually quite enjoyable to leaf through even if there’s nothing new as far as painting advice goes. Of the three books, this is my favourite. This third book is the thickest of them all, weighing in at 62 pages… if that’s a weight measurement. 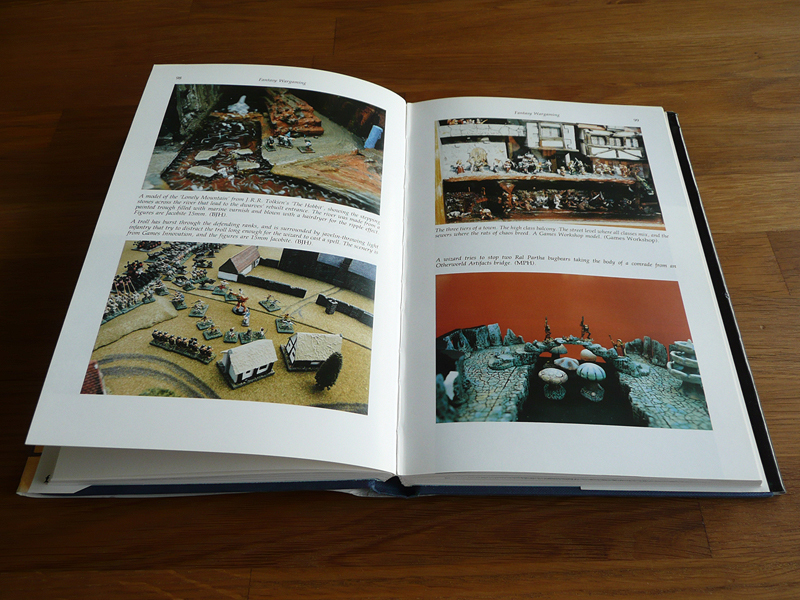 It’s also the book with the least amount of pictured miniatures. 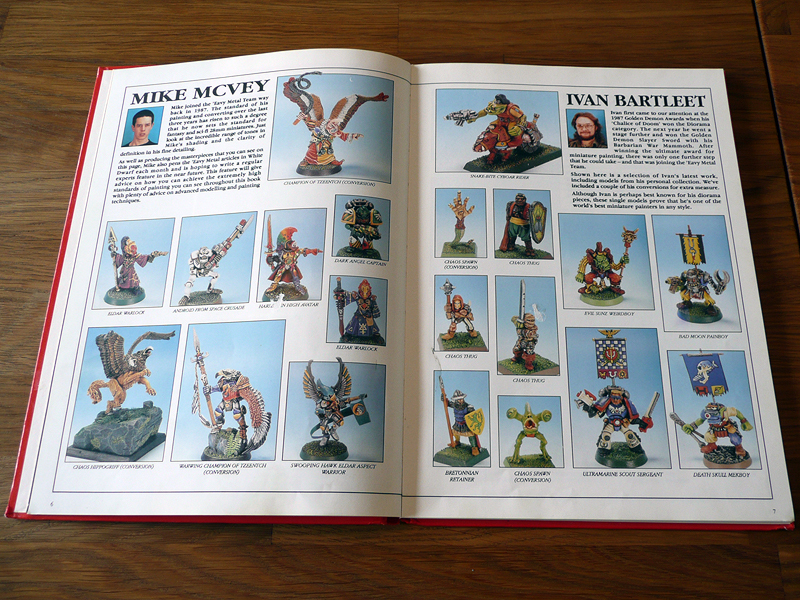 The studio pages are down to four, and each page only shows a few minis from a particular painter. 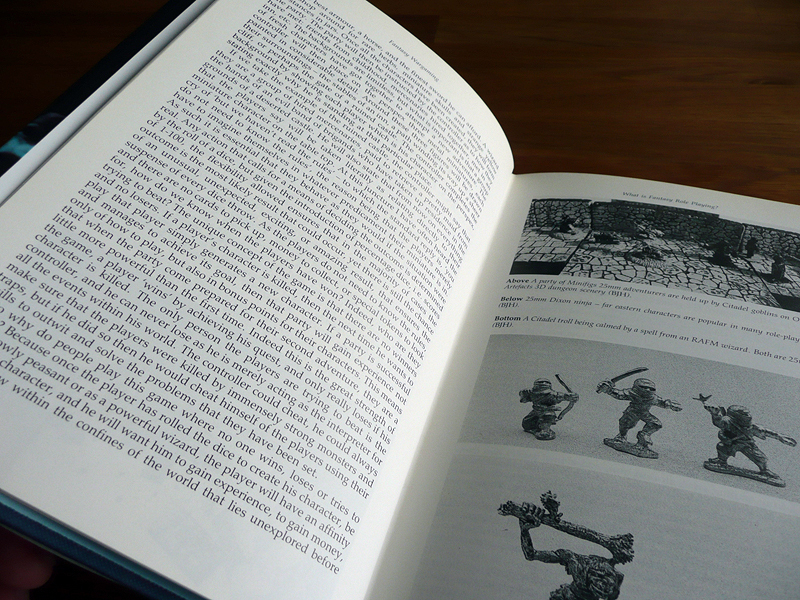 After a recap of the last three years Slayer Sword winners, pages 12-47 are dedicated to competition entries. 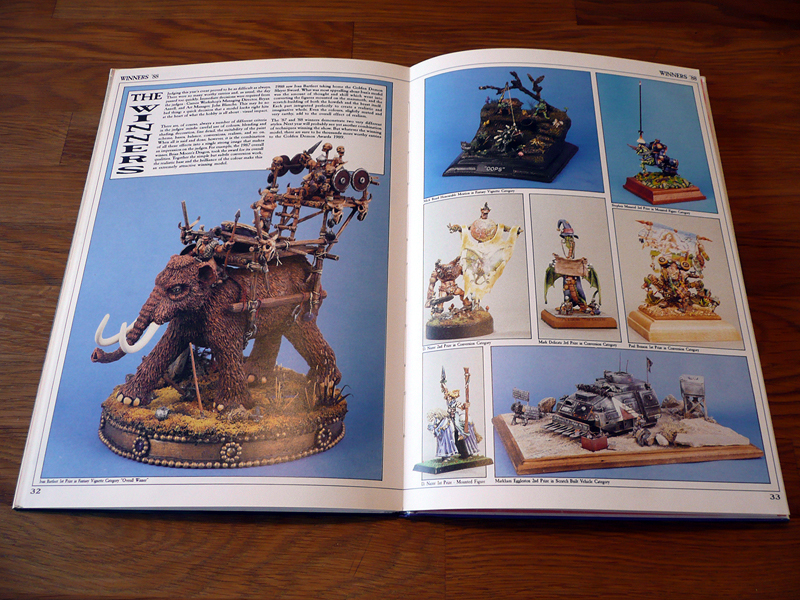 Most covered entries are allowed more room, and some pages only contain one or two large images. This is a good thing, as the dioarmas are more visible that way. As I’m mainly interested in single miniatures, I don’t care much for it. I preferred the cluttered pages of the previous two books. While the two first books were evenly mixed between fantasy and sci-fi, this book has a heavy lean towards the 40K universe. As I’m not interested in Eldar warlocks, titans and aspect warriors this book is defenitely the least interesting. If you’re into 40K there are plenty of old MK1 Land Raider conversions and enough reaver titans to shake a smelly stick at. The winning contributions are covered over ten pages, with the Slayer Sword winner getting a full spread. Nice stuff! At the end of the book is an odd, but nice, surprise. 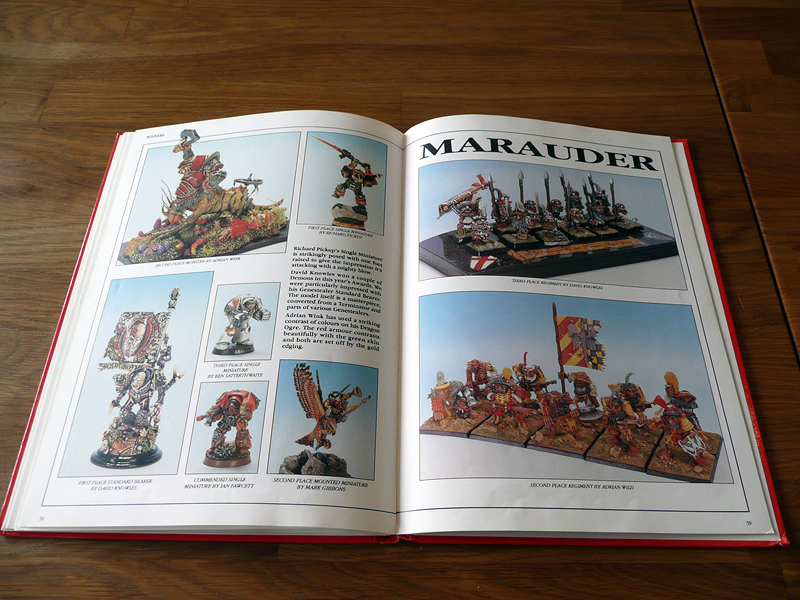 Three pages of Marauder minis, which apparently have their own little competition category. So, all in all, this is the least favourit book for me on several accounts. First of all, the old-school feel is not as thick. 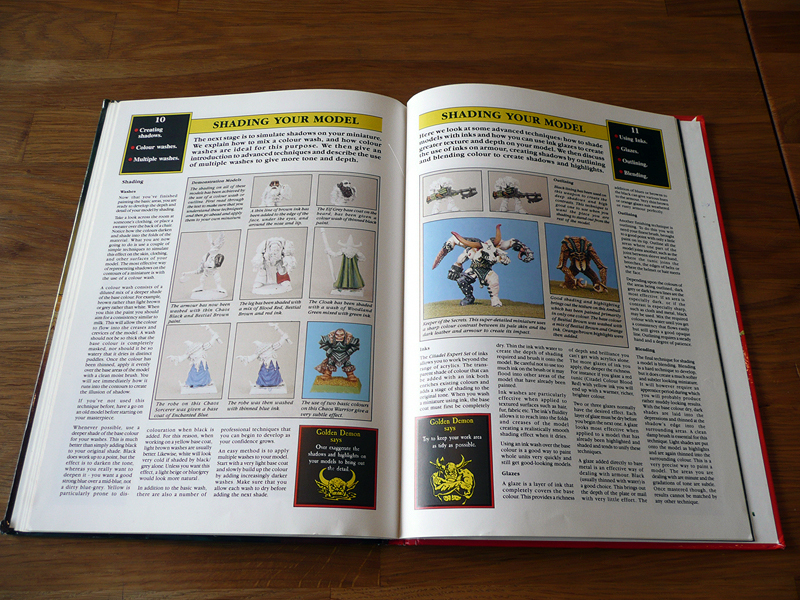 Second, there’s too much 40K stuff – but it might be a key selling feature for others. Noticed a funny trend, by the way… in previous books almost all miniatures have had a flat varnish coat (or none, hard to tell). In this book there are many contributions with gloss varnish. 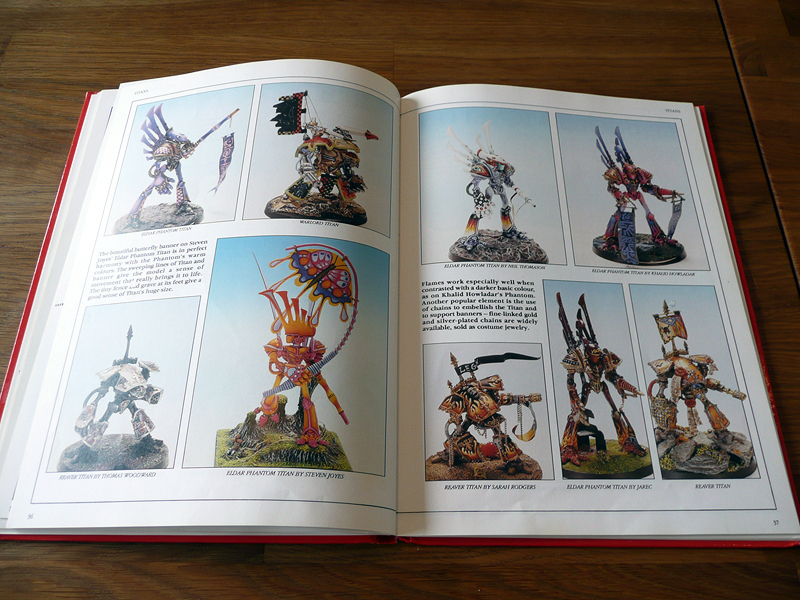 Did GW release their first gloss spray varnish in 1990? 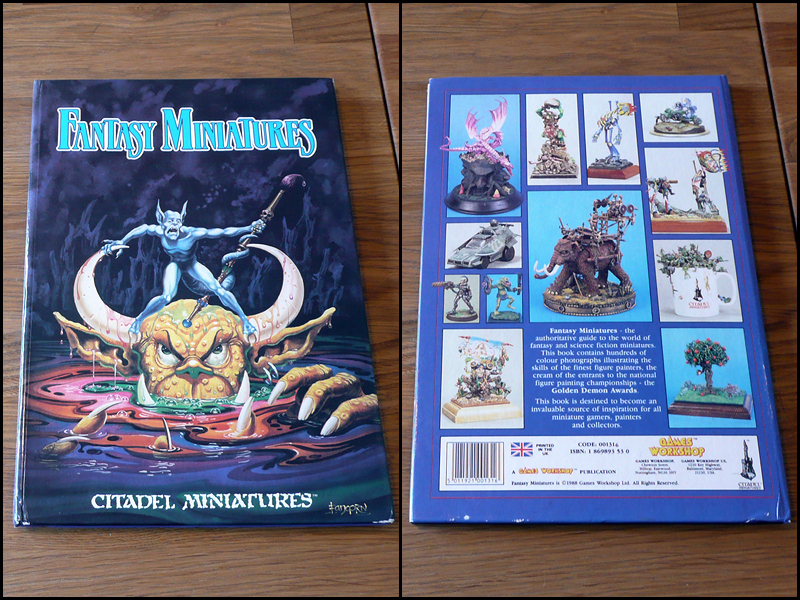 I’ve been buying various fantasy miniatures related books and publications lately, focusing on what in my opinion was the golden era of miniatures; the 1980s. My main purpose is to find inspiration for my own miniatures and modeling projects – but also to be able to get that miniature fix without having to play, paint or even get out of bed. Mmm… effortless gaming. 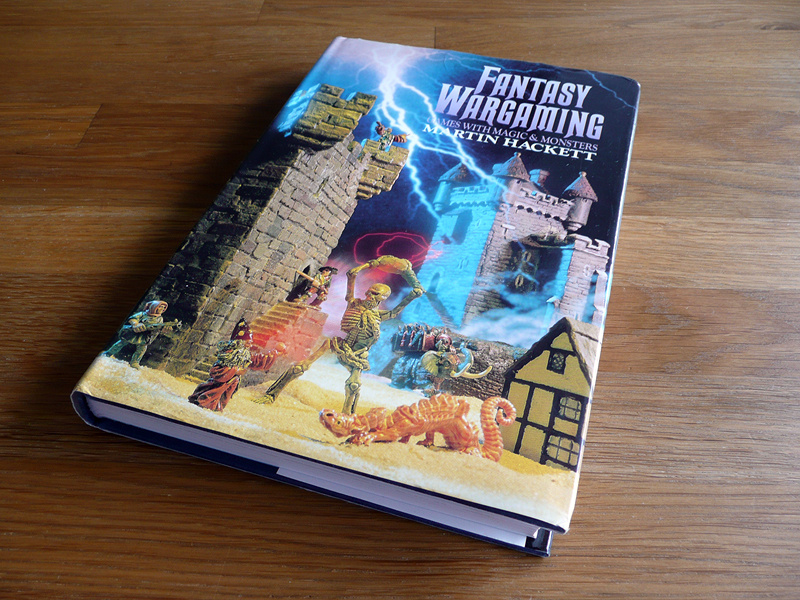 First of several books is Fantasy Wargaming – Games With Magic & Monsters by Martin Hackett. I came accross mentions of it on TMP when googling for miniature books. Comments were mixed, ranging from praise to entertaining pannings. I’ll soon get to the panning part myself. Let’s begin with the physical properties of the book. At 232 hard-bound pages, it’s fairly thick and sturdy but a bit small; only 24 cm tall and 16 cm wide. All but 8 pages are black and white. 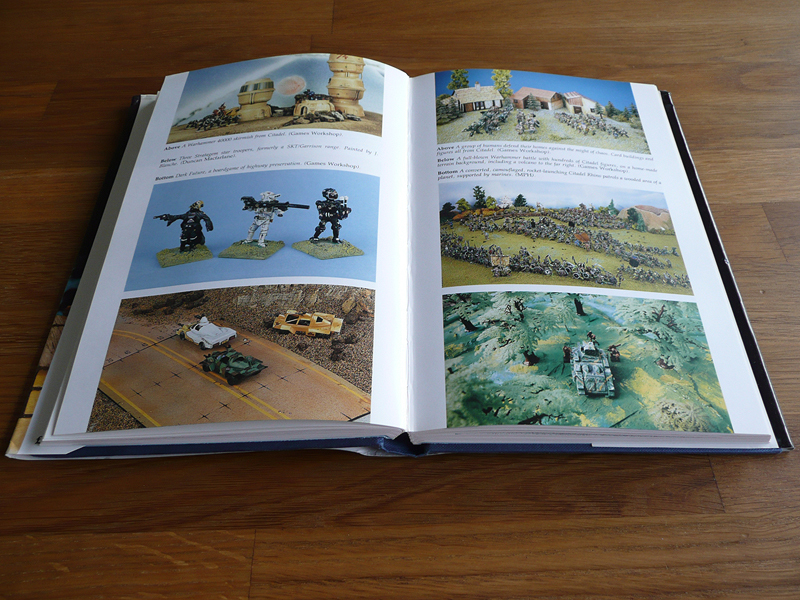 The majority of the contents of this book revolves around presenting the fantasy wargaming and role playing hobby. It’s obviously a work of passion by a guy who loves his hobby and he wants you as a reader to love it too. In his excitement he crosses the line from calm enthusiast to full on frothing geekboy fundamentalist. He gets a bit carried away. I’ve heard this book referred to as “well worth having for the pictures alone” – but that’s just not true. In fact, it’s a blatant lie. It’s not subjective or in the eye of the beholder – this book is NOT worth having for the pictures alone. Or for any other reason, as a matter of fact. The quality of most pictures is pretty poor. Black and white pictures of poorly painted and poorly based miniatures, or just bare metal miniatures. As previously mentioned, there are 8 colour pages in the centre of the book. A few of them are decent, others would have been splendid as a full page in landscape format. Most are of the author’s own poorly painted collection. 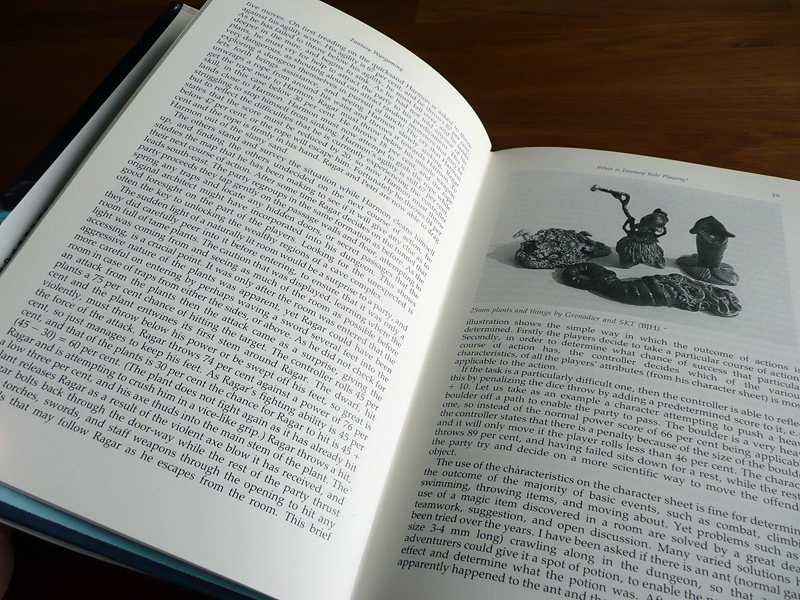 Here are two examples of how little Hackett cared for paragraphs, as well as some examples of the picture quality in the book. Apart from poor pictures and inane rambling (no, not my blog!) 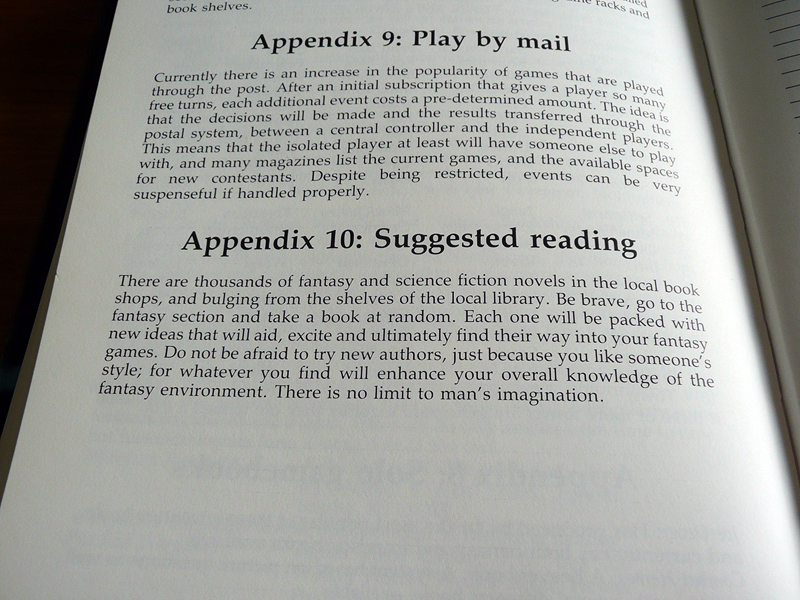 the writer decided to cram in some sort of rules system. These are the most confusingly laid out rules I’ve ever seen. 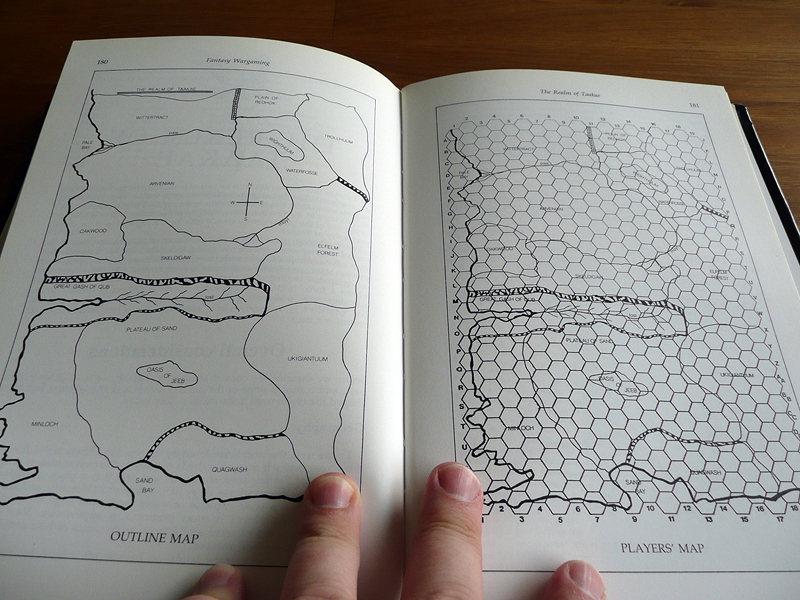 If you’ve played War of the Ring (from Fantasy Flight, not the GW game) you know there are some rather opaque rules sets out there. This beats the WotR rules, without contest! I can’t even pick out an example, as the rules are so mixed up with anecdotes and opinion that they’re impossible to make sense of. 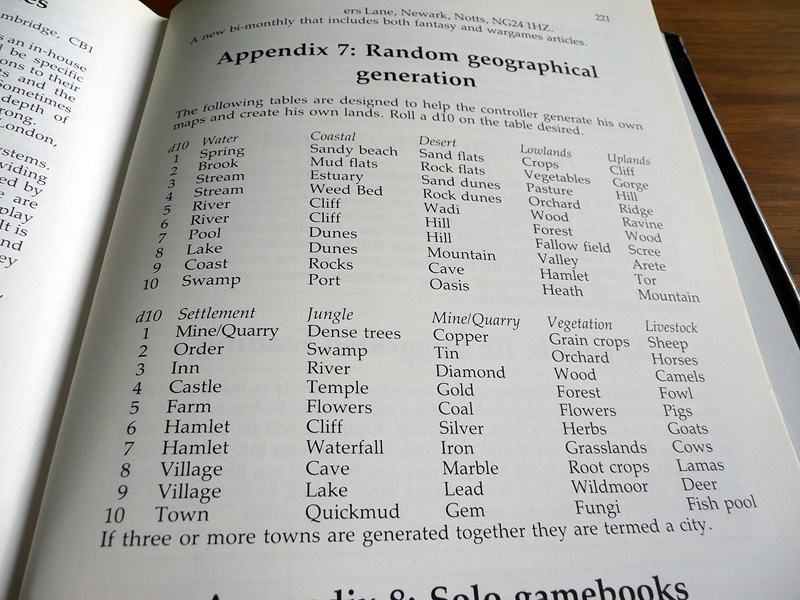 I’ll just leave you with these examples of inspirational tables and maps. Would you play a rule set by a man who made these? So, in conclusion not my finest purchase. I would recommend people to not get this book. It’s good for a laugh or two, but as a source of inspiration it fails. A few of the pictures are intriguing (I saw some cool Ventauran Space Troopers from Denizen) and the author’s genuine (but sometimes scary) enthusiasm for fantasy gaming gives him some credit. Also, it was published in 1990 and if I had owned it at that time I might’ve thought the pictures to be the dog’s danglies. Now, in 2010 it’s at a terrible disadvantage to the ‘net. Some other older books stood the test of time much better. 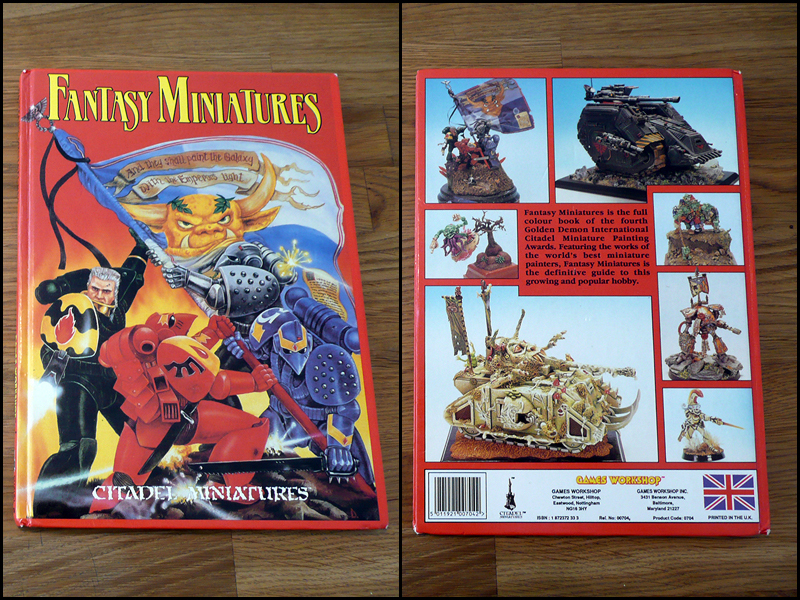 For my next “review” of sorts, I’ll take a look at the Citadel book “Fantasy Miniatures” from 1989. If you’re wondering how things are going with the Stillburg project I’m progressing nicely albeit at a slower rate than I had hoped. Two of the remaining seven hero miniatures are painted, and I’m hard at work with Aldor Berlepsch now. Once he’s done, the four main characters are finished and I’ll post them on here complete with stats and back stories.